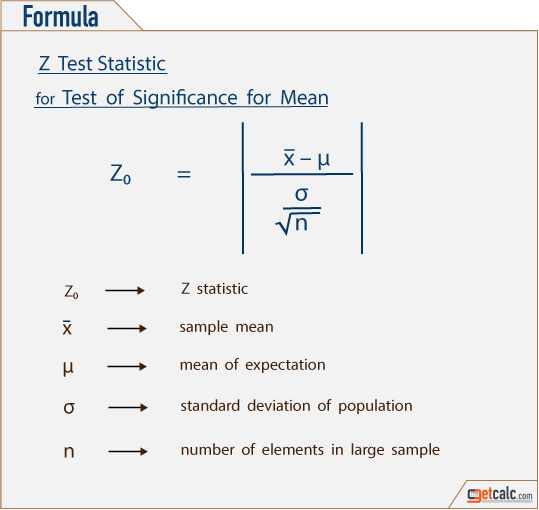 getcalc.com's statistic calculator & formulas to estimate Z0 for Z-test, t0 for student's t-test, F0 for F-test & (χ²)0 for χ² test of mean, proportion, difference between two means or proportions in statistics & probability experiments. use these statistic calculators to find the estimated value of Z0, t0, F0 & χ²0. Z, t, F & χ² Statistics are the estimated values of characteristics of population parameter, often used in Z-Test, t-Test, F-Test & χ²-Test respectively to analyze the variations of sample data sets. In such tests, the samples observations drawn from the population is used to estimate the unknown values of the population. 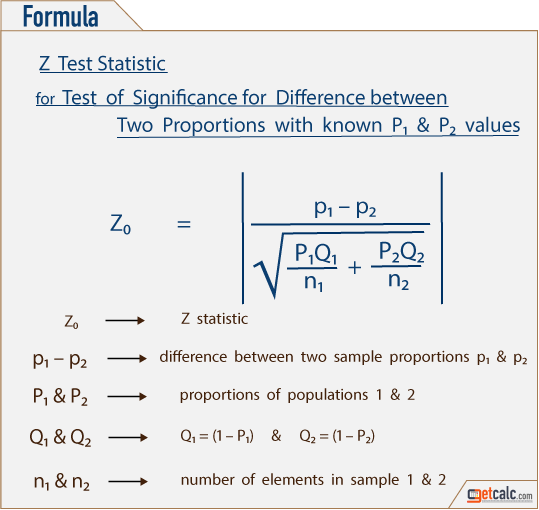 In statistics & probability, Z-statistic is inferential statistics function used to analyze variance of large samples to estimate the unknown value of population parameters. It's denoted by Z0 and used in Z-test for the test of hypothesis. In statistics & probability, t-statistic is inferential statistics function used to analyze variance of very small samples to estimate the unknown value of population parameters. It's denoted by t0 and used in t-test for the test of hypothesis. In statistics & probability, F-statistic is inferential statistics function used to analyze two or more sample variances to estimate the unknown value of population parameters. It's denoted by F0 and used in F-test for the test of hypothesis. In statistics & probability, χ2-statistic is inferential statistics function used to analyze the variances of not uniformly or normally distributed data sets to estimate the unknown value of population parameters. It's denoted by χ²0 and used in χ²0-test for the test of hypothesis. 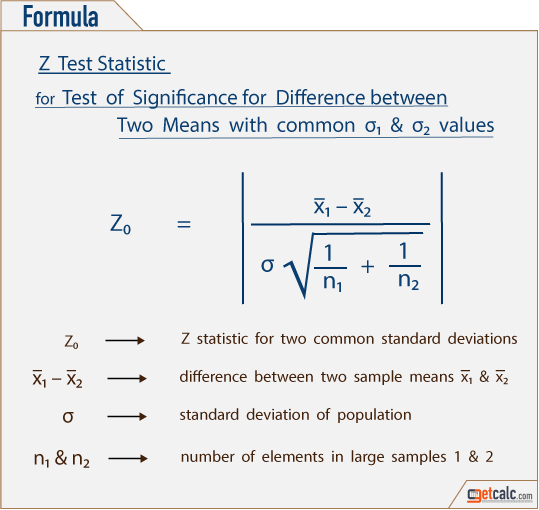 Generally, Z-statistic (Z0) calculator is often related to the test of significance for large samples analysis. 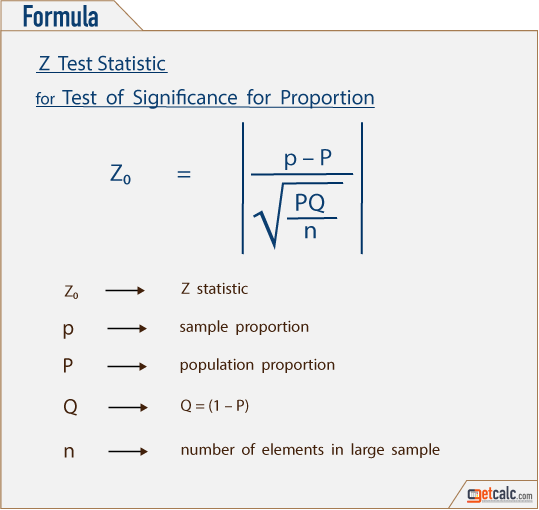 Z0 is an important part of Z-test to test the significance of large samples of normal distribution. 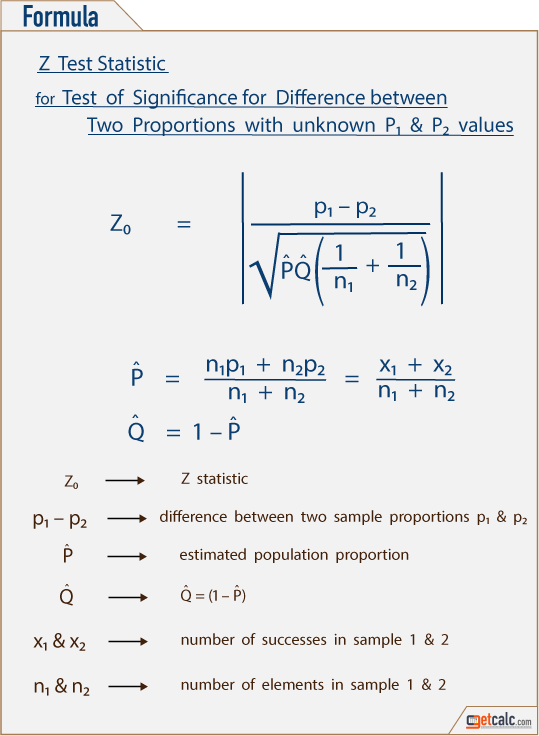 By supplying corresponding input values to this Z-statistic calculator, users can estimate Z0 for single sample mean (x̄), single sample proportion (p), difference between two sample means (x̄1 - x̄2) & difference between two sample proportions (p1 - p2) in statistical surveys or experiments. The estimated Z0 for above test scenarios is further compared with critical values (Ze) obtained from normal distribution table for the corresponding degrees of freedom to test if the null hypothesis (H0) is accepted or rejected at a specified level of significance in one (left or right) tailed or two tailed Z-test. 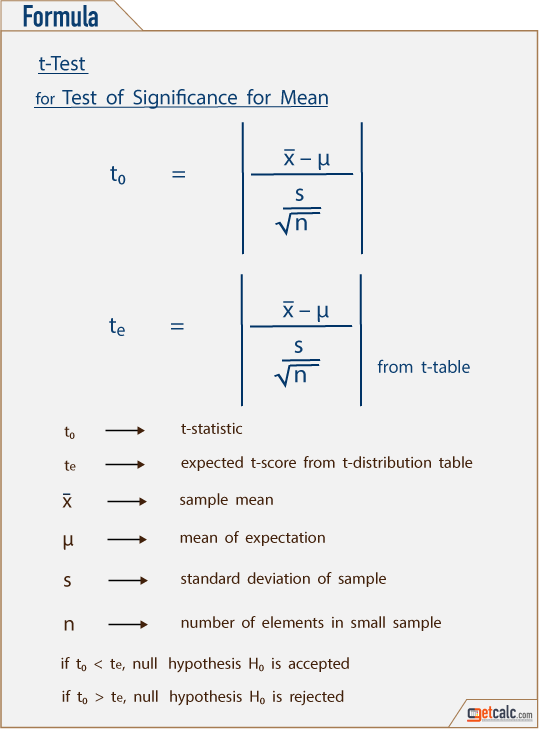 Generally, student's t-statistic (t0) calculator is often related to the test of significance for very small samples analysis. t0 is an important part of t-test to test the significance of small samples. The test of analysis for t-distribution is similar to ANOVA test if the ANOVA test involves only two sample sets in the analysis. By supplying corresponding input values to this t-statistic calculator, users can estimate t0) for single sample mean (x̄), difference between two sample means (x̄1 - x̄2) & paired or related samples mean (x̄) in statistical surveys or experiments. The estimated t0 for above test scenarios is further compared with critical values (te) obtained from t-distribution table for the corresponding degrees of freedom ν to test if the null hypothesis (H0) is accepted or rejected at a specified level of significance in one (left or right) tailed or two tailed t-test. Generally, Z-statistic (Z0) calculator is often related to the test of significance for equality between two or more sample variances. F0 is an important part of F-test to test the significance of two or more sample variances. F-statistic or F-ratio is the integral part of one-way or two-way anova test to analyze three or more variances simultaneously. By supplying corresponding input values to this F-statistic calculator, users can estimate F0 for two or more samples in statistical surveys or experiments. The estimated F0 for analysis between two samples sets is further compared with critical values (Fe) obtained from F-distribution table for the corresponding degrees of freedom to test if the null hypothesis (H0) is accepted or rejected in F-test, one-way ANOVA or two-way ANOVA experiments. Generally, Chi-squared statistic (χ²0) calculator is often related to the test of significance for samples which are not normally distributed in statistical experiments. χ²0 is an important part of χ²-test to test the significance between two abnormally distributed sample sets. 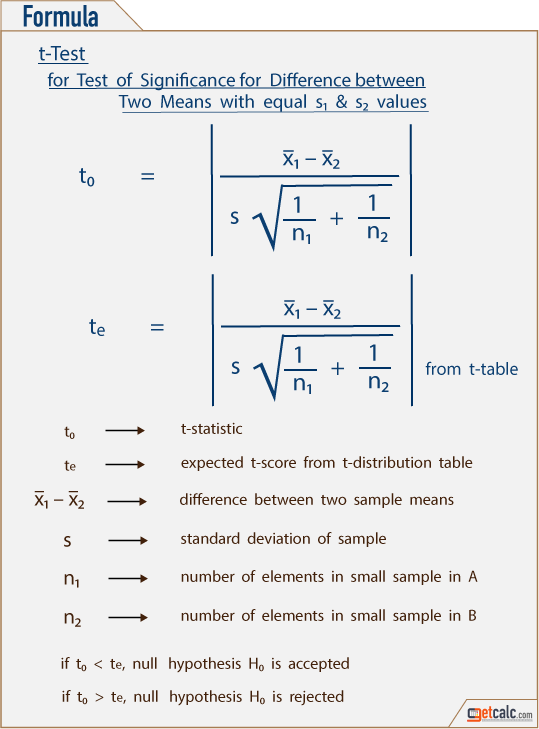 By supplying corresponding input values to this chi-squared statistic calculator, users can estimate χ²0 for two or more sample sets in statistical surveys or experiments. The estimated χ²0 for analysis between two samples sets is further compared with critical values (χ²e) obtained from χ²-distribution table for the corresponding degrees of freedom to test if the null hypothesis (H0) is accepted or rejected in χ²-test.